The purpose of this chapter is to establish the application, review, and granting/denial procedures for a conditional use permit (CUP). Some uses may have a unique and distinct impact on the area in which they are located, or are capable of impacts to adjacent properties unless given special review and conditions. Additionally, the city recognizes the need for special consideration for technological processes and equipment that are necessary for the operation of certain land uses. The intent of a CUP is to reduce the detrimental effects of land uses on adjacent properties, compensate through conditions for specialized technology, and maintain a degree of compatibility between land uses throughout the city. Consistent with allowed land uses (Tables 11.21-3, 11.21-4, and 11.21-5), a CUP is required for certain uses by the permit requirements of the applicable zone. A CUP, and any modification(s) to a CUP, may only be approved by the planning commission or city council in accordance with applicable zone requirements and in compliance with this title. A. Permit Discretion. The planning commission or city council may grant a CUP at its discretion. A CUP is not the automatic right of any applicant. B. Land Applicability. A granted CUP is only applicable to the real property for which it is granted, and is nontransferable to another location. A. Approval of the CUP is consistent with and will not adversely affect the intent and purpose of this title or the city’s general plan. B. The design and development of the land use and conditions of the CUP are compatible with the existing and future land uses of the applicable zone. C. Approval of the CUP would not result in detrimental impacts to adjacent properties or to the character or function of the neighborhood. 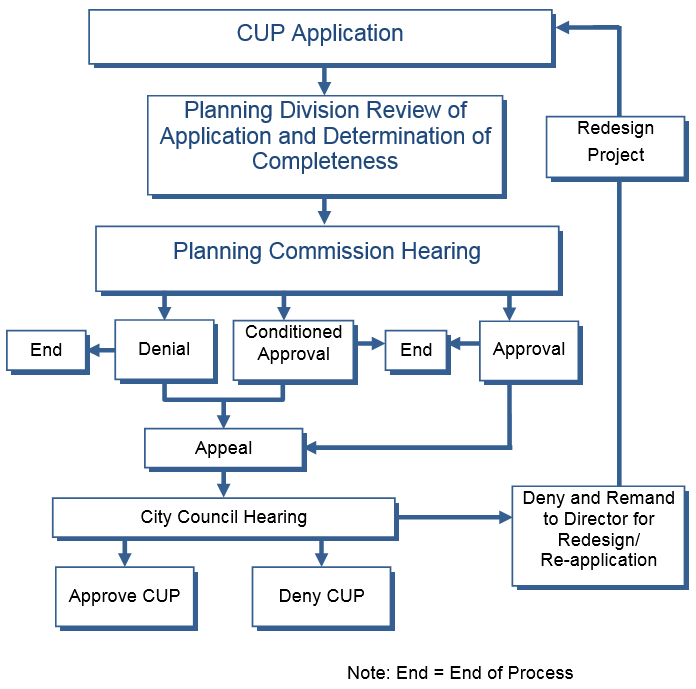 The procedure for the application and granting/denial of a CUP is illustrated in Figure 11.52-1, Conditional Use Permit (CUP) Process. A. Application. An application for a CUP shall be accompanied by all such materials deemed necessary by the director to document the conditions or circumstances of the property and land use to fully evaluate the CUP consistent with the standards of this chapter. No hearing shall be scheduled or noticed until the application is deemed complete by the planning division. B. Notice and Hearing. Upon submittal of a complete application, as deemed by the planning division, a planning commission hearing shall be scheduled and noticed, including notice to the property owner on record and nearby property owners, as provided for in Section 11.50.020, Public hearing notification. C. Conditions and Limitations. A CUP may be granted upon such conditions and limitations and for such periods of time as the approving body deems to be reasonable and necessary or advisable under the circumstances so that the objectives of this title will be achieved. D. Final Decision. The decision granting, modifying, or denying the CUP shall become final unless an appeal is filed, consistent with Table 11.51-1, Application and Review Authority. All other permit actions, including appeals, fees, effective dates, and revocation, shall be consistent with Chapter 11.50, Administration; Chapter 11.51, Permits and Procedures; and Chapter 11.56, Enforcement. E. Permit Action. Review of and action regarding a CUP may result in approval and granting, conditional approval, disapproval, or remand to the director for applicant redesign with refiling privileges. 1. CUP findings and conditions shall be recorded and notification shall be sent consistent with Section 11.50.020, Public hearing notification. The decision shall include reasoning, valid zoning code section references, and any conditions and citations imposed on the permit by the approving body. Parameters and conditions of the CUP, as approved by the approving body, shall be considered development and performance standards applicable to the subject property. 1. Revoke the CUP, revoke and reissue the CUP with new or modified conditions, or modify the conditions of the existing CUP as may be appropriate under the circumstances. 2. Impose, as a condition of the continuation, reinstatement, or reissuance of the CUP, a requirement that the permittee reimburse the city for all costs and expenses reasonably incurred in investigating, identifying, and documenting the violation, and in processing information concerning the violation for presentation to the planning commission, and, upon any appeal, to the city council. 3. A CUP shall be revocable if the exercise of rights granted by the CUP are discontinued for six consecutive months. The use subject to the CUP may not be resumed if the CUP is revoked; a new CUP, including processing and public notification, shall be required.